I found this ad in an old copy of the Clare County Cleaver, our local newspaper in Harrison, a while back. For some reason I found it humorous and took a photo of it. Temple is a town about 15 miles west of Harrison in Clare County.Used to be an old logging community on the Pere-Marquette railroad line a century ago or more. Not much there now, maybe not even beaver. I never had beaver so that is one reason the ad struck my fancy. Wonder what it tastes like? 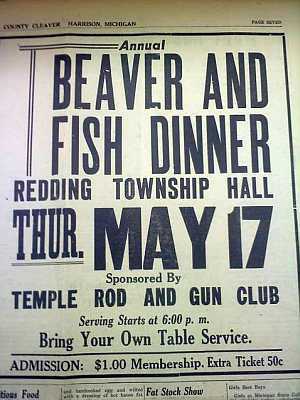 (And please don’t say “chicken.”) Just too doggone bad ain’t nobody serving no beaver no more.